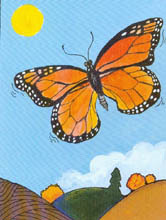 "Gail Gibbon's wonderful book on the life cycle of the monarch butterfly is still one of the best basic resources on the topic for use with primary students. Her bold, bright illustrations vividly highlight each important text point, with labeling when necessary. The text is equally crisp and informative, providing young readers with good information about monarchs, and the instructions for raising a monarch butterfly themselves. Bonnie Kelley-Young is the perfect narrator. Her voice is as clear and well-defined as the text and illustrations. The addition of occasional background music and sound effects adds just the right touch. Page-turn signals are optional. This would make a great listening center for classrooms doing butterfly units." "Gibbons's book celebrates the life, habitat, and migration of the monarch butterfly, and provides tips for raising one. Bonnie Kelley-Young's narrative voice is well suited to the subject matter and its audience. Her gentle reading captures the wonder a young listener will have upon discovering the beauty of the Monarch. The sound effects enhance the story and add to the sense of wonder. Young does a fine job of distinguishing the text from the labels that are part of the illustrations and from the pronunciation guides for sounding out the scientific words. The page-turn signals allow time to explore the illustrations and read the labels."